Get more information about the Madison MAN, or sign up now, at the link below. Building economic and community stability together in a networked cooperative for doing the work we want to do. A Mutual Aid Network (MAN) is a new type of networked cooperative, designed to create means for everyone to discover and succeed in work they want to do, with the support of their community. We're developing shared savings pools to provide investment funding for each other's projects and needs, and emergency funds for neighbors in need. Meeting spaces, tool and expertise libraries, exchange platforms, and a vehicle for cooperative ownership of the things we need, but don't use often or can't afford alone. Monthly social events for new and existing members, workshops to learn about and create the economy we want, free food and childcare for members and guests, and expert project assistance. Since the early 2000s, the Social Justice Center (SJC) on Williamson Street in Madison has served as a shared-office venue for established and nascent social-justice nonprofit organizations. The MAW involves further collaboration with communities and groups inside and outside the Center, including a variety of resource-sharing initiatives. 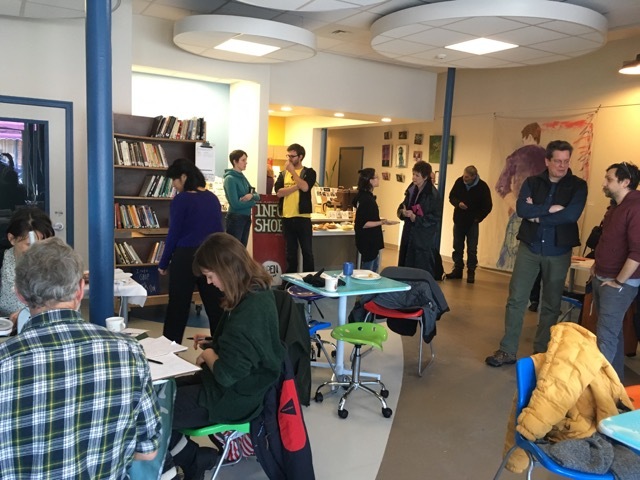 Projects currently planned by MAW partners include co-working space, a library of things/ ongoing swap, shared equipment and administrative support for participating organizations and individuals, and a vibrant learning community. Future priorities include establishing an incubator for enterprises capable of generating community-owned wealth while enhancing community quality of life. Founding organizational members of the MAW include: The Dane County TimeBank, 608 Arts, Common Good Bookkeeping Cooperative, Wisconsin Empathy Guild, the Interpreters’ Coop, and Madison InfoShop. The MAW will serve as a home base for coordination among projects and networks in Dane County with similar and complementary interest areas. We are accepting both individual and organizational memberships Join early and help shape the whole project! Each member has a voice and a vote. The Madison Mutual Aid Network, "the new man" as some of us are calling it, allows us to all constructively invest in each other - it's a new economy, one built by and for working together. Southwest Digital Bridges (SDB) will provide home internet access and savings for members of the Russett Road neighborhood. The program also provides training for interested youth and adults in mesh installation and maintenance so they become stewards of their network. In turn, network users agree to donate one hour a month. SDB uses Dane County Time Bank as a tool for network users to access the network without the need for money. Network stewards earn Dane County Time Bank hours for their work on the Russett Road network and on networks in other neighborhoods. Networks will be able to provide security communication options for specific community uses such as ride-sharing, neighborhood announcements, promotion of community projects, neighborhood activists activities, and more neighborhood needs.